Transformation of the spiral arteries. 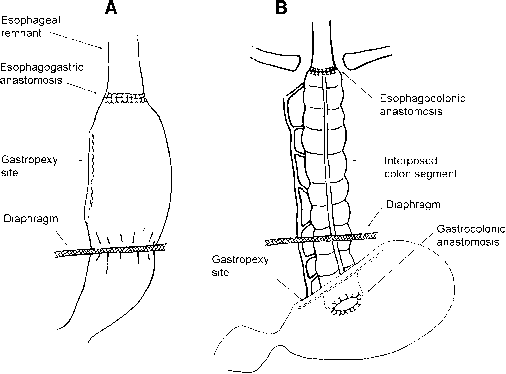 A, The process by which the maternal spiral arteries are transformed into dilated vessels in pregnancy is believed to involve invasion of the spiral arterial walls by endovascular trophoblastic cells. These cells migrate in retrograde fashion, involving first the decidual and then the myometrial segments of the arteries and then causing considerable disruption at all layers of the vessel wall. The mechanisms involved in this complex process are only beginning to be elucidated. 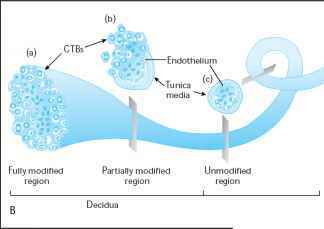 These mechanisms involve alterations in the adhesion molecules of the invading trophoblast cells, such that they acquire an invasive phenotype and mimic vascular endothelial cells .